Disbanded Texas Rangers are gathered together to help the U.S. Cavalry put an end to marauding outlaws. Roy Rogers: These men claim that I'm Billy the Kid and it ain't so. Roy Rogers: Right here's a man who knows me. Henchman: Yeah, well who knows him? Frog Millhouse: Well he does. 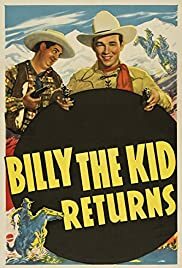 For Roy Rogers second starring feature Republic Pictures had him play Billy The Kid in Billy The Kid Returns. He also plays a nice chap named Roy Rogers who wants to become a deputy sheriff to Pat Garrett. When the film opens we see Roy as Billy breaking out of that famous shootout at McSween's store and later shot down by Pat Garrett played here by Wade Boteler. But Roy as Roy arrives from Texas and is mistaken for the notorious outlaw. As he's a good guy Garrett keeps up the deception as Billy continues his Robin Hood ways of helping the homesteaders and robbing the cattle barons to do it All this is winked at by Boteler because he's under pressure to protect the new settlers. In the end through the aid of Smiley Burnette on loan from Gene Autry films and playing his Frog Millhouse character Garrett and Rogers find a way to get the cattlemen good and nailed for their crimes. In the meantime Roy finds a bit of romance with Lynne Roberts the storekeeper's daughter. Roberts would be Roy's leading lady in most of his early films. A couple of nice western ballads are included for Roy in this second film which proved that his success in Under Western Stars was not a flash in the pan.